Written by experts and authorities in the field and professionally narrated for easy listening, this crash course is a valuable tool both during school and when preparing for the USMLE, or if you're simply interested in the subject. 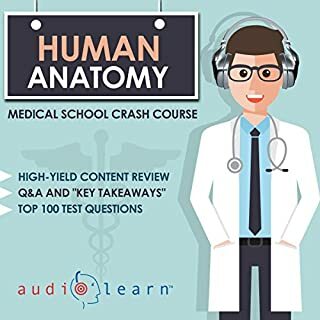 The audio is focused and high-yield, covering the most important topics you might expect to learn in a typical medical school Human Anatomy course. Included are both capsule and detailed explanations of critical issues and topics you must know to master the course. I actually got this for a friend who's preparing to get a PHD abroad and doesn't have English as his native language. This was super helpful to prepare him, and even I learned some things although I'm not from the medical area. He went ahead and bought other books from the same collection! He was intrigued...Nathaniel Hammond, Earl of Beverton, is working to restore his new estate and aid his tenants. 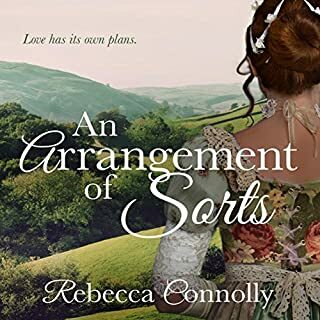 But everything changes when he meets the beautiful and mysterious Moira Dennison, a bold young woman who offers to hire him, unaware of his title, to help her find her fiancé. Curious and unable to resist, Nathan accepts her offer, keeping his true identity a secret, never dreaming of what the future held for him. Stories like this are a breath of fresh air. I listen to all kinds of book, and always enjoy when one like An Arrangement of Sorts comes around. Although there isn't a whole lot of plot, there also isn't a big villain or anything crazy going on. Just follow two people falling in love slowly and getting to know each other in this sweet romance! Well-read, observant, and spirited, a young Elizabeth Bennet draws the attention of a wealthy widower. When she finally meets Mr. Darcy, she outranks him. Of course, that doesn't stop him from insulting her. Married and wealthy, is she still beneath his notice? 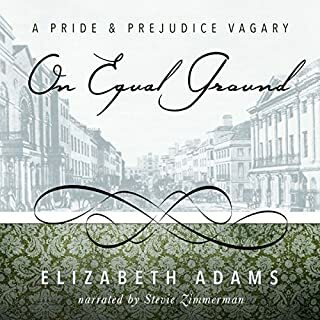 Elizabeth's high society connections create new opportunities for her sisters and, in turn, keep Darcy close to her family. When tragedy strikes, will Darcy rise to the occasion? This would make a great movie! Loved it! 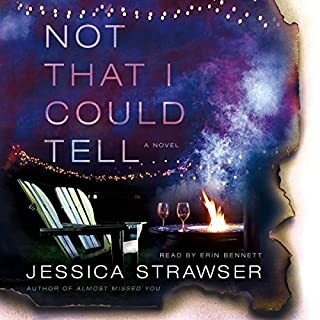 I think what I liked the most about this book is that it's such a fresh take on the original story that you don't even need to have read Pride and Prejudice to enjoy it. It's original enough to entertain even those who are not fans of Pride and Prejudice, but still like a nice, romantic story. 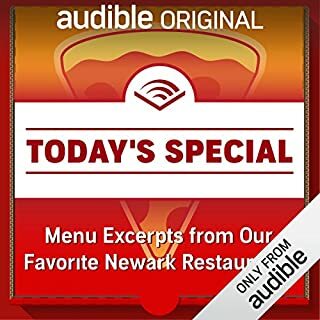 You said you'd listen to your favorite narrators read anything: Well, this ambrosial new audiobook brings together an acclaimed cast of narrators to read aloud the menus of some of our favorite local restaurants here at Audible headquarters in Newark, New Jersey, as only they know how. You haven't truly lived, or dined, until you've heard Cassandra Campbell capture the emotional nuances of Newark's best Indian-inflected burgers or let Nick Podehl extol the virtues of the pear arugula salad and then seductively steer you toward a plate of creamy mushroom linguini. "I could listen to them read a menu!" "I could listen to X read a menu! ", people said. Well, Audible delivered. Enjoyable, funny, and hunger-inducing! When a group of neighborhood women gathers, wine in hand, around a fire pit where their backyards meet one Saturday night, most of them are just ecstatic to have discovered that their baby monitors reach that far. It's a rare kid-free night, and they're giddy with it. They drink too much, and the conversation turns personal. By Monday morning, one of them is gone. Everyone knows something about everyone else in the quirky small Ohio town of Yellow Springs, but no one can make sense of the disappearance. This book was my companion for a week, as I listened to it during my runs. It was a pleasant listen, I really liked the narrator. It had enough suspense to keep me intrigued - it reminded slightly of the beginning of the series Slasher, on Netflix - and a (in my opinion) solid conclusion. Not rating 5 stars ("It's great" instead of "I loved it") because I would have liked more plot twists and surprises, but that's just my personal taste. Still would recommend! Ben Carter, pet care specialist, is hired to walk a Shiba Inu named Toby. Unbeknownst to Ben, Toby is no ordinary dog but an inugami - an immortal demon born in feudal Japan and bred for only one purpose...murder. A mysterious cult seeks to capture the inugami and harness its power for evil. With the help of an elderly luchador and a cop with a heart of gold, Ben must protect Toby and uncover the secret of the Tengu. Grab a leash and a muzzle, trouble is afoot!!! 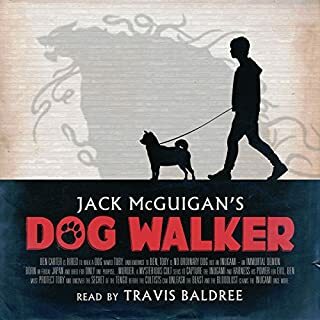 Where does Dog Walker rank among all the audiobooks you’ve listened to so far? It's one of my favorites, for sure. Not one of those "oh jeez, this one ranks among Dickens and Tolstoi", but one I'll certainly recommend to those I can. Which character – as performed by Travis Baldree – was your favorite? Dragon Mask was really enjoyable. Travis was able to make him sound as I pictured him in my mind: old, tough, and fun. I laughed more than I cried, but I did feel emotional in one or two scenes. Someone else has already said it, but here goes: MOVIE VERSION, PLEASE!